We’ve all heard about a Groupon gone wrong. That’s when a merchant gets bombarded with unprofitable customers who spend no more than the coupon is worth and have no intention of ever returning. A New York start-up believes it has a solution for high-end restaurants, which like the idea of filling empty tables but are terrified at what a coupon deal might do to everyday business. The company has relaunched as Savored.com (formerly VillageVines) and is doubling the number of markets it serves to 10. It may be on to something. In the past six months, the company has grown from six employees to 45 and has increased reservations by 335 percent and subscribers by 228 percent. Additionally, participating restaurants are on track to generate more than $25 million in sales this year. Members who sign up for the service pay $10 to book a reservation at a restaurant and in return get 30 percent off their entire bill, including alcohol. The restaurant keeps all of the profits. That differs significantly from daily deals sites, which typically keep half of the revenue from a voucher that is already 50 percent to 70 percent off. McKean said the model is completely different. 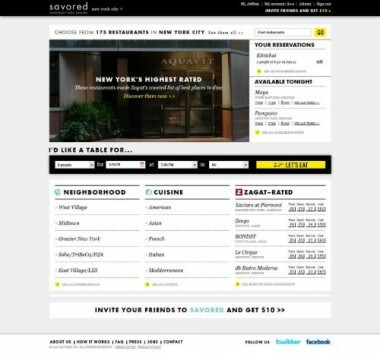 Restaurants alert Savored.com to a specific number of tables on specific nights that they know they won’t be able to fill on their own. Savored.com helps them fill those otherwise empty tables, just as Priceline helps hotels fill empty rooms or airplane seats. Some of the 500 participating restaurants are high-end names like Daniel Boulud, Jean-Louis, Peter Kelly’s Xaviars, Capital Grille, China Grill, Aquavit and the Patina Group. The service is live in Atlanta, Boston, Chicago, Denver, Los Angeles, Miami, New York, Philadelphia, San Francisco and Washington, D.C.
An important part of the process is discreetness: The need to print out a coupon or even mention that the table was reserved through Savored is completely eliminated. McKean said restaurants like it because other patrons don’t know that some tables are receiving a discount, and patrons like that they don’t have to fuss with print-outs or disclose to their eating partners that they aren’t paying full price. Since Savored.com is making only $10 from each transaction, its model is less profitable than the traditional daily deal. But McKean is okay with that because he believes he is building a much more sustainable business (plus, the company has raised only $4 million in venture capital.). Next up for the company is vertical expansion this year to new areas, such as spas and travel.